Daily life getting worse by the minute …. Israeli soldiers frequently storm the neighborhood and often spray sewage and tear gas at residents and in their homes. Predawn military raids are regularly carried out, where young men are detained and Israeli forces ransack homes while families are sleeping inside. “The Israeli occupation is trying to practice a policy of humiliation at the military checkpoints in the main exits of al-Issawiya,” said Hani al-Issawi, a member of a local committee to defend land in in the town. “Residents are not allowed to leave the village in groups. Every single person must undergo inspections,” he added. Men, including the elderly, are forced to pull up their shirts up and sometimes take their trousers down upon entrance and exit to the neighborhood, while many undergo physical inspections. Female residents of the town are often searched by female soldiers who decide whether to carry out physical inspections or to check their bags and identification documents. Israel forces on Oct. 14 closed roads leading into the neighborhood with concrete barriers, setting up make-shift military and police checkpoints for all residents to pass through. The move was made shortly after Israel’s security cabinet announced that Israeli police are now entitled to “impose a closure on, or to surround, centers of friction and incitement in Jerusalem, in accordance with security considerations,” according to Israeli media reports. 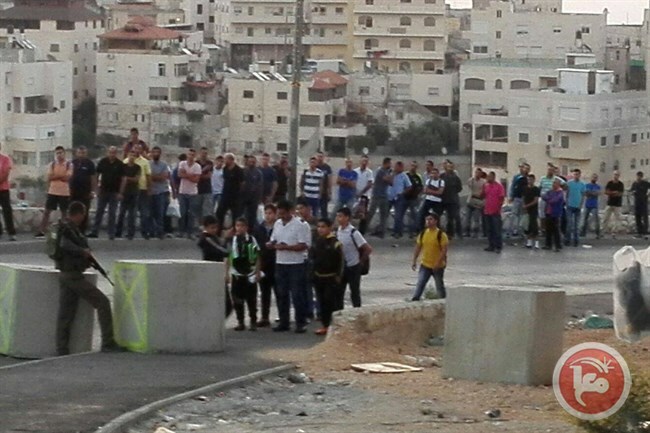 “Every morning, queues of schoolchildren, workers and employees are seen waiting in front of the checkpoint,” he added, saying that inspecting a single person takes two to give minutes.In addition, schoolchildren need to take two buses to their schools: one that reaches the end of the closed road, and a second that the children reach after passing through the make-shift military checkpoint by foot. Around 3,400 Palestinian schoolchildren leave the neighborhood every morning for schools in Jerusalem, while around 3,200 schoolchildren from neighboring areas attend schools inside al-Issawiya, including two schools for people with special needs, Abu Hummus said. In response to the Israeli crackdown, Palestinian factions in the neighborhood announced general strike on Tuesday. The strike was announced shortly after Huda Muhammad Darwish, 65, died after being delayed from reaching a hospital at a checkpoint leading out of the town. The elderly woman had suffered breathing difficulties following clashes in the neighborhood, in which tear gas was fired. Her family tried to rush her to hospital, but locals told Ma’an that Israeli troops ignored that there was a sick person in the car, delaying them at the checkpoint. While punitive measures have increased over the last week in response to a series of stabbing attacks that have left at least nine Israelis dead since Oct, 1, Issawi pointed out that Israeli forces had started “collective punishments” against the neighborhood months ago. Israeli rights group B’Tselem last week called the Israeli government’s response to the recent escalation in the area as “the very inverse of what ought to be done” toward ending recent violence. Al-Issawiya is one of several Palestinian neighborhoods in occupied East Jerusalem that has come under such restrictions. Israeli forces on Sunday began installing a large concrete wall to separate the Palestinian neighborhood of Jabal al-Mukabbir from the illegal Israeli settlement of Armon Hanatziv. While a similar order was made for al-Issawiya, Israeli media reported that Israeli Prime Minister Benjamin Netanyahu ordered that plans to erect separation barriers around the town be scrapped, after pressure from members of the Knesset, the Israeli parliament.